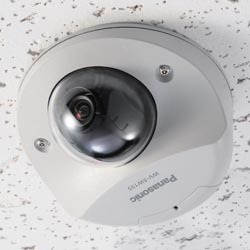 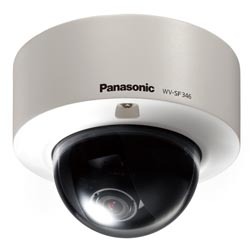 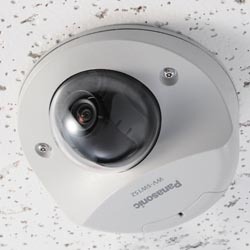 Panasonic’s i-PRO SmartHD WV-SW152 is a low profile, vandal-resistant, SVGA compact dome network camera that provides 800×600 transmission using a 1.3 megapixel high-sensitivity MOS sensor. 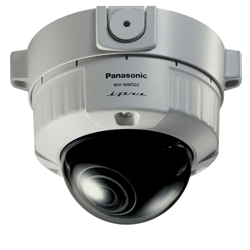 Additional features of the WV-SW152 include high sensitivity with day and night (electrical) function, 16x electronic sensitivity enhancement, and Variable Image Quality on Specified Areas (VIQS) – a technology that allows a designated area to retain higher image quality while excluding areas that have decreased image quality to lower the image file size and bit rate. 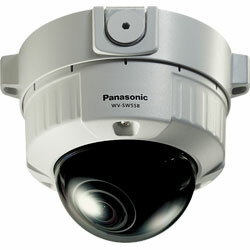 Zoom (2x) is controlled by the browser, with a 2x extra zoom (4x) available under VGA resolution.